Following the Patient Protection and Affordable Care Act’s emphasis on Accountable Care Organizations (ACOs) and the announcement of the Medicare Shared Savings Program, an increased interest has emerged among providers and payers to create ACOs. To date, little has been published regarding the types and locations of organizations adopting principles of accountable care. 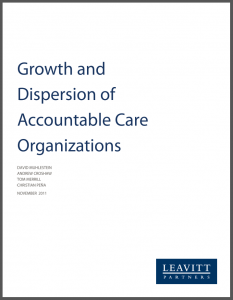 As part of an ongoing national study, Leavitt Partners identified ACOs from news releases, media reports, trade groups, collaborations and inter-views through the beginning of September 2011. Also included were entities that either self-identified as being an ACOs or specifically adopted the tenets of accountable care including financial accountability for the health care needs of a population, managing the care of that population and bearing that responsibility at an organizational level. Leavitt Partners then mapped the market of each of these entities based on the States and Hospital Referral Regions (HRR) associated with the hospitals that each entity utilizes. Of the 164 identified ACOs, the sponsoring entities included hospital systems, physician groups and insurers with a market presence in 41 states but less than half of all HRRs. Of these entities, 99 were primarily sponsored by hospital systems, 38 by physician groups and 27 by insurers. A clear movement is evolving within the health care industry towards the accountable care model of providing health services. Adoption of this model will vary greatly due to both regional differences as well as variations among the sponsoring entities. Since the 2010 passage of the Patient Protection and Affordable Care Act (PPACA), industry, media and national interest has grown in the concept of the Accountable Care Organization (ACO)1,2. With backing from the White House3 and the conviction of Centers for Medicare and Medicaid Services (CMS) leadership that they will lead to better care, better results and decreased costs4, Medicare has placed added emphasis on developing ACOs as part of the Shared Savings Program5 and Pioneer ACO6demonstration projects. Additionally, private payers are experimenting with ACO-centric initiatives in an effort to increase the value they receive for the prices they pay by lowering the cost of care, improving the outcomes, or, ideally, both7. While there are some specific requirements to participate in Medicare’s demonstration programs, ACOs can take many different forms within and apart from Medicare. Since there are likely many models that will be able to achieve the same goals, there is little reason to define what an ACO is and, instead, the emphasis should be on identifying what an individual ACO does and then study the different approaches that can lead to the desired results. To this end, the loose definition of an ACO suggested by McClellan et al is the most fitting: an organization that seeks “per capita improvements in quality and cost” with some degree of accounta-bility8. To clarify, an ACO must be, to some ex-tent, financially accountable for the health care needs of a population, manage the care of that population and bear that responsibility at an organizational level. To download the complete report, click here. Reblogged this on lava kafle kathmandu nepal. Enter your email address to follow ACO Watch and receive notifications of new posts by email. A ‘pulse check’ on the race! With the March 2010 passage of the ‘Patient Protection and Affordable Care Act (PPACA), the ‘follow the money’ floodgates are once again opening for hospitals, physicians, integrated delivery systems, health plans, and consultants. This time, instead of migrating ‘HMO lite’ (neither staff nor group model) platforms into mainstream medicine via IPAs, or MeSH model JV’s, we’re now talking about their ‘new and improved’ successors broadly cast as ‘Accountable Care Organizations aka ‘ACOs’. Some call it ‘managed care 2.0′, while the more cynical among us envision it as the full employment act for consultants, and health care lawyers, shopping a not ready for prime time, if not fundamentally flawed ‘business model’. Given the high level of interest in these ostensible quality promoting, while cost restraining entities, the staggered implementation timeline in general, the ACO January 1, 2012 fuse in particular, and the broad brush framework intentionally reflected in PPACA, we thought it a good idea to keep a pulse on the ramp up to the highly anticipated ‘go live’ date. From HMOs and PPOs to ACOs and DPCs: What’s Next?